On this hour-long cruise, you can expect swashbuckling fun with treasure chests, face painting, pirate games, dancing, water cannons, limbo, plus more. This activity is fun for the entire family and provides picturesque scenery of the Potomac River. 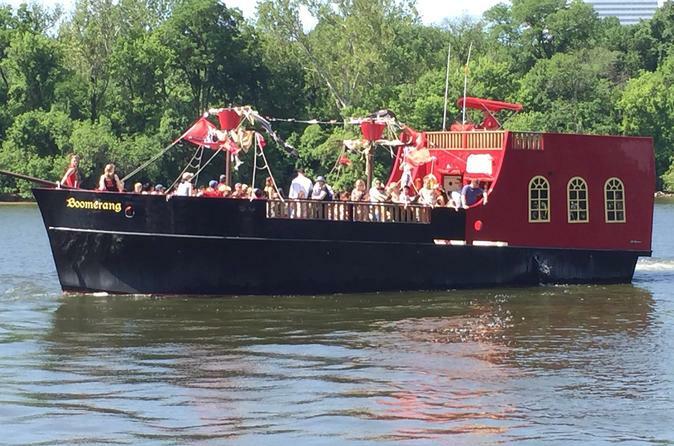 The gangplank is awaiting your arrival so you can cruise the Potomac River on an adventurous treasure hunt. You will be joined by friendly pirates protecting the Nation’s Capital from any boisterous buccaneers that might get too close. The city’s most valued treasure is on board this ship but recently, it was was stolen! Your help is needed to search the waterways looking for the scallywags who committed this theft. The ship is protected with water cannons and teamwork is needed as you fire upon the bad guys during a fierce battle at sea. Once you recover the missing goods, you can celebrate your success while sailing the high seas back into port.